The Tontine Hotel RestaurantPeebles - The Royal Burgh : Visit and discover the County Town of Peeblesshire. The official website. 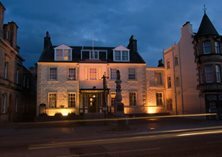 Situated in the heart of Peebles, the Tontine is a family run hotel known locally for warm hospitality, comfortable en suite bedrooms, excellent service, great value and delicious locally sourced food. Welcome to the Tontine Hotel in the heart of Peebles. From contemporary dining in our Bistro to relaxing over a meal in our grand Adam room restaurant, we offer a choice of dining experience, but always using fresh locally sourced produce. Even if you just want to drop in for a drink or a snack we have that covered too – from morning coffee to home-made afternoon tea or even a delicious cocktail in our friendly bar or comfortable lounge. Whatever the time of day we have something to suit everyone and at a price you will love! Come and enjoy a drink in the comfort of the Tontine Bar or Lounge.